I installed Mac OSX theme for Ubuntu 13.10 (I am a new Ubuntu user), and I am wondering how I can remove (not hide) the left menu bar, and move all programs to the bottom menu bar (Max OSX theme). You can't. "Unity" is the Desktop Environment you are currently using and it is built to be with a left menu bar and a dash. You could hide it, but there isn't any option to remove it. If you want to get closer to the OSX look, you should change your Desktop Environment. In my opinion, I would think that the best suited for this would be "Cinnamon" or "Xfce". 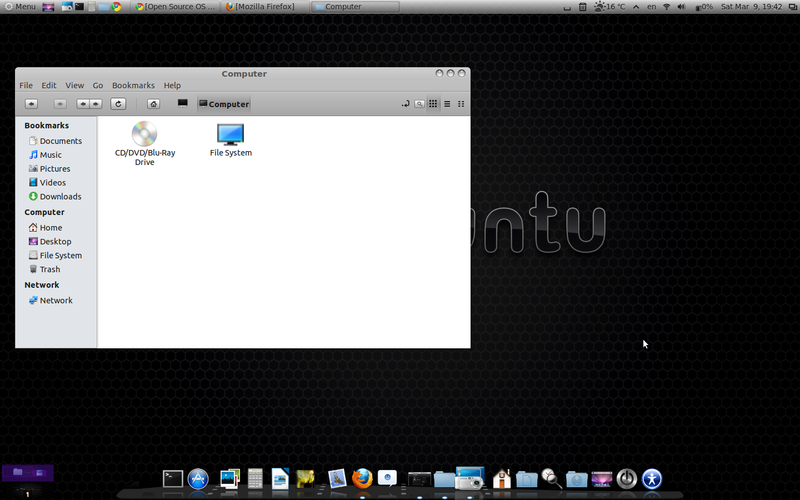 Note : those 2 screenshots were found on Google Image and show how you can turn Cinnamon & Xfce into a OSX-look-alike. None of these Desktop Environment are like this by default. Cinnamon is a Linux desktop created by the Linux Mint Team, which provides advanced innovative features and a traditional user experience. The desktop layout is similar to GNOME Panel (GNOME 2); however, the underlying technology was forked from GNOME Shell (GNOME 3). The emphasis is put on making users feel at home and providing them with an easy to use and comfortable desktop experience. After installing all the necessary packages, just log out and change the log-in option to Cinnamon. This D.E. (Desktop Environment) has a built-in theme manager provided by Linux Mint and Cinnamon Community. Xfce is a lightweight and modular Desktop environment currently based upon GTK+ 2 though in the future it may be ported to GTK+ 3. Xfce contains a suite of applications such as a window manager, a file manager, and a panel to provide a complete user experience. Xfce is popular with many users, partly because it is lightweight but also because a large amount of settings are exposed in a GUI. This is in sharp contrast to desktops such as GNOME Shell which hide many settings from the user. After installing all the necessary packages, just log out and change the log-in option to Xfce. After a tour, and if you are satisfied with one of these new D.E., you can uninstall Unity. But please aknowledge that I (personnaly) think that you should use Ubuntu the way it was meant to be used, even if the possibility of tweaking the OS is one of the main Linux-feature. In my humble opinion, I think that if you like OSX, you should buy a MAC instead of making Ubuntu looking like it, because Ubuntu will never be OSX (and it's not his goal). Not the answer you're looking for? Browse other questions tagged unity or ask your own question. Can I move the Unity launcher? How can the Unity toolbar at the left be moved to the bottom & auto-hide activated? How to relocate the Unity top panel to the bottom? How to reset Ubuntu's theme? Is there a OSX Yosemite-like icon theme?